Dr. James Simpas, Clint Bennett, and Dr. Endawoke Yizengaw at Manila Observatory (MO). Top right: AMBER sensor surrounded by bamboo fence at MO Davao Station. Bottom right: AMBER box being carried inside MO Solar Research Building. 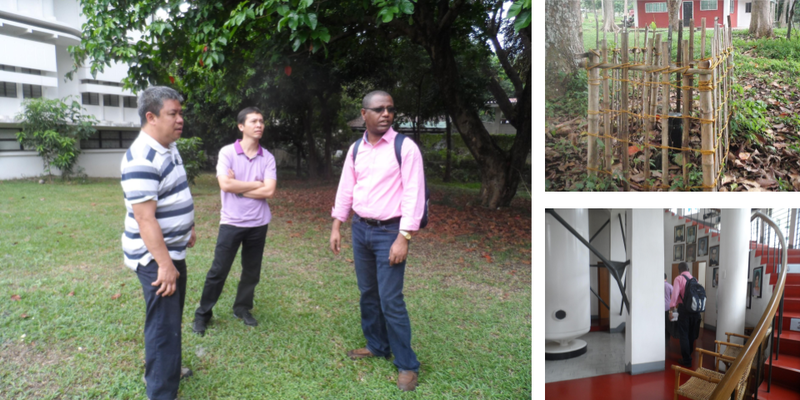 Two AMBER (African Meridian B-field Education and Research) magnetometers were installed in the Philippines. The first was installed at Manila Observatory’s Davao station in Matina Hills in 12 February 2016 and the other at the Magnetic Observatory of the Philippine National Mapping and Resource Information Agency (NAMRIA), Muntinlupa in 13 June 2016. The principal investigator of the AMBER project is Dr. Mark Moldwin from the University of Michigan, while the principal investigator of the AMBER expansion project is Dr. Endawoke Yizengaw from the Institute of Scientific Research of Boston College. The installations in the Philippines were led by Dr. James Simpas and Clint Bennett. Dr. James Simpas is an Assistant Professor of the Department of Physics of Ateneo de Manila University and head of Urban Air Quality / Instrumentation Technology Development and programs (UAQ/ITD) at Manila Observatory. Clint Bennett is an Instructor at the Department of Physics of Ateneo de Manila University, Coordinator of the Philippine MAGDAS (Magnetic Data Acquisition System) Network, and research staff of the Upper Dynamics Program of Manila Observatory. The AMBER magnetometer network was built by Boston College to gain a more complete global understanding of equatorial ionospheric motions. AMBER magnetometer stations are used to connect the European IMAGE-SAMNET-SEGMA magnetometer arrays to low and dip-equator latitudes, and link up with South African Intermagnet and Antarctic magnetometers in the southern hemisphere. Amber aims to provide complete meridian observation in the region and filling the largest land-based gap in global magnetometer coverage. The two AMBER installations in the Philippines at Davao and Muntinlupa were funded by the Air Force Office of Scientific Research (AFOSR). 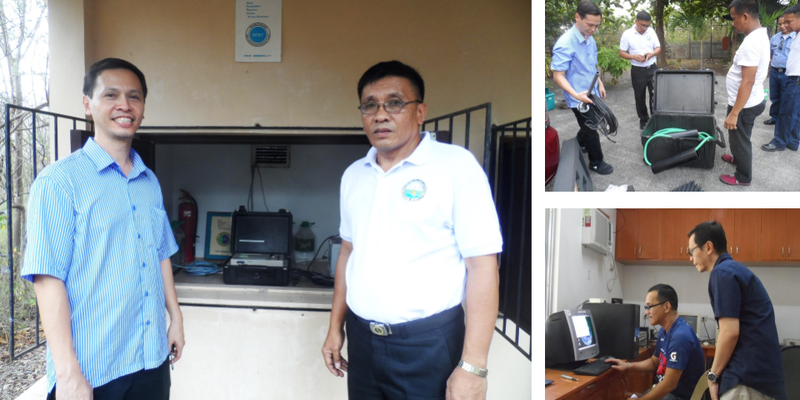 Last 12 February 2016, Dr. Endawoke Yizengaw of Boston College was accompanied by Dr. James B. Simpas, the head of the Instrumentation Technology Division of Manila Observatory, in the installation of an AMBER magnetometer in MO-Davao station at Matina Hills, with the help of MO-Davao staff Efren Morales and Ruel Narisma. Davao is an important location since through it passes the magnetic dip equator where the geomagnetic field is nearly horizontal and not tilted from the vertical unlike at the poles. Along the magnetic dip equator flows the Equatorial Electrojet (EEJ), which is a narrow ribbon of eastward current that peaks around 1:00 pm local time. During geomagnetic storms, ring currents are also formed in the equatorial region at 3 to 5 times the radius of the earth (about 6,378 km). The EEJ and ring currents generate magnetic fields around them which can be measured by the magnetometers near the equator. 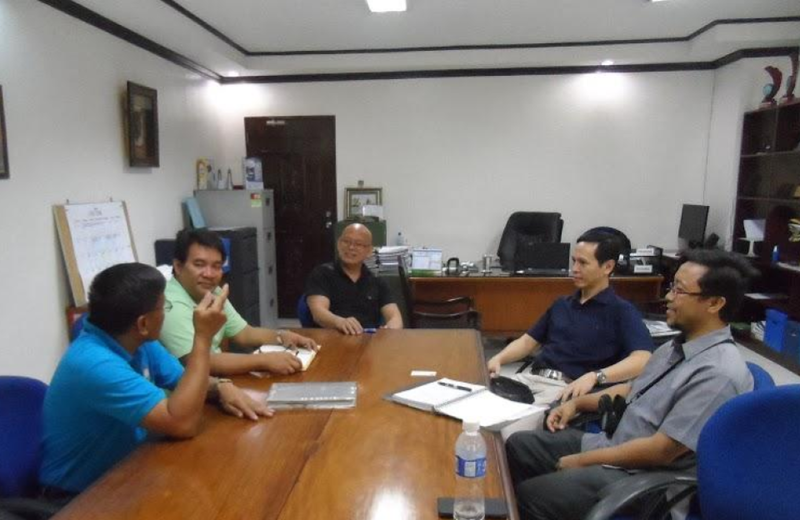 Last 9 February 2016, a few days before the AMBER magnetometer was installed at MO-Davao station, Dr. Endawoke Yizengaw met with Clint Bennett, Dr. Quirino Sugon Jr, and Dr. James Simpas at Manila Observatory. Dr. Yizengaw brought with him the box containing the AMBER magnetometer sensor, cable, and logger. But after some tests, the magnetometer data received was too noisy. 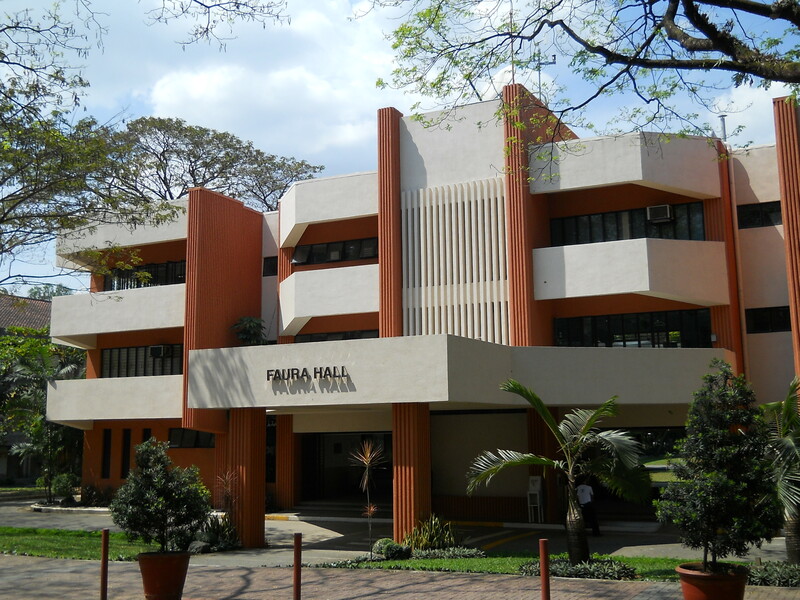 Clint Bennett and Dr. James Simpas also tested the magnetometer readings at the Jesuit Residence near the High School area of the Ateneo de Manila University Campus last 24 February 2016. The data was still noisy. They tried to test again 4 days later for about 30 min. The same noise problem. A new location is needed. Clint Bennett and CPO Alex Algaba in front of the MAGDAS magnetometer data logger at the Magnetic Observatory of NAMRIA in Muntinlupa. Top right: Clint Bennett and Ezequiel Manalac of MO unloads the AMBER cables. Bottom right: Henry Nayve and Clint Bennett of MO sets up the internet connection of the AMBER sensor in NAMRIA office. Last 5 March 2016, Clint Bennett contacted CPO Alex Algaba of the Magnetic Observatory of NAMRIA (National Mapping and Resource Information Authority), and asked permission to install the magnetometer at the observatory in Muntinlupa. A month later, CPO Algaba informed Mr. Bennett that Commodore Jacinto M. Cablayan, Director of the Hydrography Branch of NAMRIA, had obtained the permission from NAMRIA for the installation of the AMBER magnetometer. NAMRIA was created in 1988 by DENR (Department of Environment and Natural Resources) to “provide the public with mapmaking services and to act as the central mapping agency, depository, and distribution facility for natural resources data in the form of maps, charts, texts, and statistics.” NAMRIA’s Director is Dr. Peter Tiangco who manages four technical branches: (1) Mapping and Geodesy, (2) Hydrography, (3) Resource Data Analysis, and (4) Geospatial Systems Management. The Hydrography Branch acquires and analyzes hydrographic and oceanographic data for promoting navigational safety and oceanographic research. The outputs are nautical charts, navigational warnings, and tide and current predictions. The hydrography branch also collects 12-month geomagnetic data from magnetometers hosted by NAMRIA, which are part of OHP (Ocean Hemisphere network Project) of the University of Tokyo and the MAGDAS/CPMN (Magnetic Data Acquisition System / Circum-pan Pacific Magnetometer Network) Project of Kyushu University. Now, the hydrography branch also collects 12-month geomagnetic data from the AMBER Netowrk. These data are used together with those from 18 repeat stations all over the country to construct data products such as geomagnetic maps. Last 14 April 2016, Clint Bennett together with Exequiel Manalac and Dr. Quirino Sugon Jr. visited the NAMRIA Magnetic Observatory in Muntinlupa, bringing with them the AMBER magnetometer set. They were welcomed by CPO Alex Algaba. Because of the length of the magnetometer cable is not long enough, the magnetometer was buried only a few meters from the iron gate, such that whenever the gate is opened or closed, the magnetometer readings jump. On 13 May 2016, Clint Bennett returned to NAMRIA together with and Henry Nayve and Dr. Quirino Sugon Jr to adjust internet settings of AMBER’s BeagleBone, so that the data would show up in the AMBER website. The set-up was finished about noon. Then the MO team, together with CPO Alex Algaba, traveled to NAMRIA headquarters in Manila. There they were received by Commodore Jacinto M. Cablayan, Director of the Hydrology Branch of NAMRIA. Clint Bennett and Dr. Quirino Sugon Jr discussed with Commodore Cablayan and his staff the AMBER network, the Manila Observatory, and NAMRIA’s interest in geomagnetic field data. The action step agreed in the meeting was the creation of an MOU between MO and NAMRIA regarding the AMBER installation. On 13 June 2016, the magnetometer was transferred to its final location, more than 200 m from the iron gate. It’s now in the woods behind magnetometer house, far from vehicular or human traffic. Meeting at the NAMRIA Hydroglogy Branch office at Manila. From left to right: CPO Alex Algaba, Eng’r. Dennis Arsenio B. Bringas, Commodore Jacinto M. Cablayan, Clint Bennett, and Dr. Quirino Sugon Jr.